Summit, Roper, Goulds G&L, Dean, Grundfos, Crane Deming, Oberdorfer, Crown, Tuthill, Aurora, Mission, Bowie, Liberty, Boerger, Warren Rupp, Wheatley Gaso and National Oilwell. Today we are going to discuss industrial pump basics. It’s extremely important that operators know the ins and outs of the machinery they operate, otherwise how can they be expected to perform repairs when machinery goes down? Let’s start with the basics. ANSI is a private, non-profit organization that oversees the development of voluntary consensus standards for products, services, processes, systems and personnel in the United States. 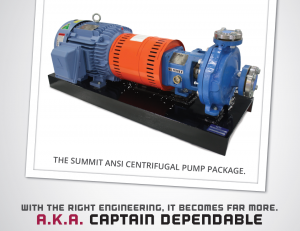 ANSI pumps are typically preferred because their parts are functionally and dimensionally interchangeable. In other words, you can swap one pump out with another, even if it’s a different brand, because all of the parts should be dimensionally the same. Roughly 68 percent of all rotating equipment in the world (generators, engines, etc. ), are pumps. There are essentially two different classifications of pumps — centrifugal and positive displacement. Of the roughly 68 percent, approximately 86 percent are centrifugal. A centrifugal pump is a pressure creating device that converts velocity energy to kinetic energy by accelerating liquid to the outer rim of a revolving device known as an impeller. The faster you turn the device, the more pressure you are going to get. It’s important to note that a centrifugal pump does not create pressure, it only creates flow. Pressure is a measurement of the resistance to flow and flow is dependent upon the pumps’ system characteristics. A positive displacement pump is a flow-creating device that makes fluid move by trapping a fixed amount and forcing or “displacing” that trapped volume into the discharge pipe. Unlike centrifugal pumps, positive displacement pumps are “constant flow machines” and will produce the same flow at a given speed (RPM) no matter the discharge pressure. A positive displacement pump operating against a closed discharge valve, will continue to produce flow until the pressure in the discharge line increases to the point where the line bursts or the pump is severely damaged — or both.